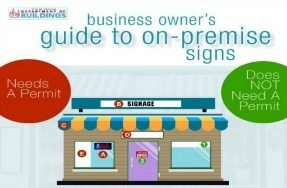 The Chicago Department of Buildings recently created a user-friendly Business Owner’s Guide to On-Premise Signs. This guide provides an updated list of permit requirements for business signs. Check out the FAQ below and access the complete guide here for more information. What types of signs need a permit? What types of signs do not need a permit? Complete the online and supplemental hard copy application. Submit both applications to the Department of Buildings (DOB), City Hall, Room 900. DOB will log in your application and route it to Business Affairs and Consumer Protection (BACP). Once approved, it will be routed to Zoning for review and approval. After approvals from BACP and Zoning, DOB conducts a review, issues any corrections, and issues the permit. What are the requirements for signs on or over the public way? For signs that are on or over the public way, you will need an additional permit called a Public Way Permit. Obtaining this permit requires a signature of approval from your Alderman’s office. You can download that application here. How much signage can I display? A business is allowed a minimum of 32 square feet. Anything beyond this allowance is subject to zoning regulations based on location. What does a sign permit cost? Zoning review fee for an on premise sign: $200.00. An inspection of $40 for the first 100 square feet, plus $1 for every square foot over 100 square feet is assessed every two years (i.e. $40 for a 100-square-foot sign and $45 for a 105-square-foot sign). Where can I find more information on incidental sign standards? Contact Zoning at (312)744-5777 for information and questions regarding incidental sign standards.